In 2010, we began an archaeological and ecological research collaboration to study the social and ecological effects and contexts of clam gardens. We chose to work along the shores of northern Quadra Island, B.C. because that area has one of the highest densities of clam gardens on the coast. There is also a high density of ancient settlements marked today by huge shell-rich archaeological sites (“shell middens”). The study sites, all accessed by water, are within the traditional territories of the Laich-Kwil-Tach and Coast Salish Nations. Schematic showing the integration of the cultural and ecological aspects of our research. During her Masters work at Simon Fraser University (SFU), Amy Groesbeck (along with her advisors Anne Salomon, Kirsten Rowell and Dana Lepofsky) explored how clam gardens affect nearshore ecology of clam beaches. Amy’s portion of the larger Quadra Clam Garden study addressed the questions: 1) Do clam gardens today enhance clam productivity; and 2) In what ways do they increase productivity? 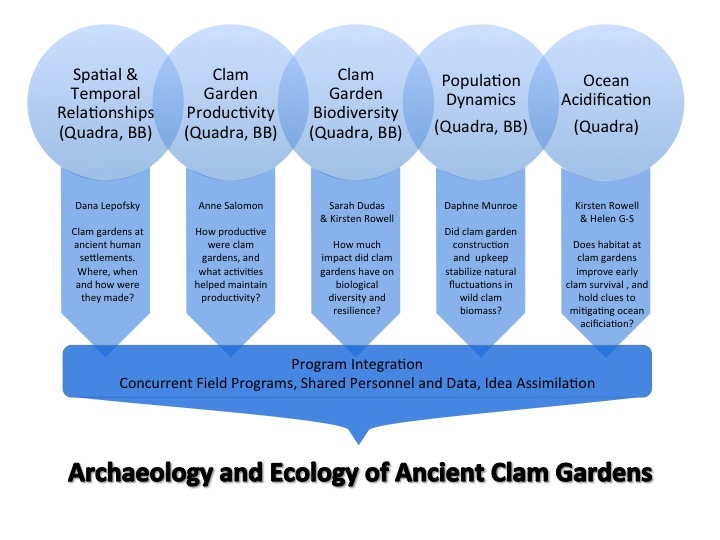 The hypotheses of clam gardens enhancing clam productivity were derived from traditional knowledge, archaeology, and marine ecology. Amy and her research team investigated these questions through a series of intertidal surveys and clam transplant experiments. This study found that clam gardens enhanced optimal clam habitat for littleneck and butter clams, evidenced by higher densities, biomass and growth rates within clam gardens. The archaeological portion of the collaboration involves several components. First, building on the work of John Harper and others, the team recorded the location of every clam garden in two of the largest bays at the north end of Quadra – there are hundreds! We found cleared beaches and garden walls in almost every cove we visited, and in many adjacent strips of shoreline. Large settlements, with the remains of ancient houses sitting on meters of shell layers, are located throughout the two largest bays. Any settlement not on a fine sandy beach at the head of inlets is associated with a clam garden. In addition, many of the clam gardens have no associated settlement. SFU M.A. student Misha Puckett has taken shell samples from all stratigraphic layers at some of the settlements. She has done this task to obtain material for radiocarbon dating and to measure the abundance, size and growth rates of the shellfish collected from clam garden beaches. The team predicts, based on the results of our ecological work in clam gardens, that clams in middens will be more abundant, larger and grow faster after clams started to be tended in clam gardens. To understand this relationship, we also need to understand the temporal relationship between clam gardens and settlements. By radiocarbon dating barnacles or shells trapped at the base of the clam garden walls, the archaeological team is determining when the rock walls were built. So far, clam gardens are at least 1,000 years old. We have also dated various shell midden settlements in the study area, the oldest date is about 4,000 years ago. The goal is to understand when people started building clam gardens and the relationship of this productive and sustainable source of clams to the creation of these large shell midden sites. To accompany the ecological studies and midden excavations, SFU M.A. student Ginevra Toniello will be excavating the clam garden beaches to look at how the building of the wall changed the productivity of the clam beaches in the past. She will be describing the sediments, and measuring the number, size and rate of growth in clams, in the beach sediments below the clam garden terrace, and in the clam garden beaches. We expect to see that the beach sediments after the clam garden was built are finer and more shell-rich and that the clams are more abundant and grow faster and bigger. By digging in the clam gardens we found that many of the gardens were built on bedrock! That means these gardens created productive shellfish beaches where there was none prior.